As the culture around us continues to rot morally and spiritually, we cannot help but recognize that blame first lies with the church. Because Jesus said, “You (believers) are the salt of the earth. But if the salt loses its saltiness, how can it be made salty again? It is no longer good for anything, except to be thrown out and trampled underfoot” (Matthew 5:13). Today, we are experiencing what a nation looks like when the church refuses to be the conscience of society – or, in Christ’s words, when Christians lose their saltiness. Can you imagine what your personal life and relationships would look like if your conscience went dark for a day, or a week? Talk about pandemonium in the Benham household! It’s important to know when Jesus used metaphors in His teaching He wanted us to pay close attention. 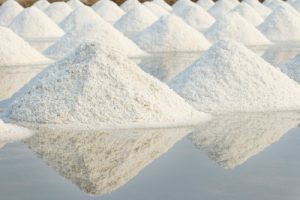 So let’s take a closer look at salt and see what as Christians are supposed to act like today. Sustains: If you put salt on a steak, it prevents rot and preserves the meat. So, too, preserving family values prevents societal decay. Christians should sustain that which God has ordained. Salty believers allow individuals and nations to flourish. Seasons: Whatever you apply salt to becomes savory with taste. Salt brings out the flavor of what it’s applied to. You don’t bite into a steak and say, “Wow, that salt is amazing.” It simply makes the steak better. Christ followers should also season the environment with life, bringing solutions to problems and creativity to the culture. Startles: Smelling salts startle an unconscious person awake, like a trainer with a boxer who’s been knocked out. When a believer speaks the truth in love by the power of the Holy Spirit, it awakens darkened hearts, revives the soul and restores the nation. Sanitizes: Gargling with lukewarm salt water cleanses a sore throat. Infections by bacteria are no match for nasty tasting salt water, just like cultural sickness stands no chance against salty Christians mixed in with the cleansing water of the Holy Spirit. Stings: Salt stings when it cleans a wound. Sometimes it hurts when things need to be cleaned, but it’s necessary for healing to come. God’s solutions aren’t always easy, but they are necessary for our nation to be healed. Sacrifices: Salt gives its life for whatever it’s applied to – like disappearing on a steak. Christians are called to lay down their lives that others may live. This includes reputations, social status, etc. Scatters: You don’t put salt in a pile; rather you scatter it for max effect. The early church was scattered throughout the earth for the Gospel to take full effect. In our nation, Christ’s followers should be everywhere (media, arts, business, sports, etc. ), spreading the good news of the Gospel. Small: You don’t use just one particle of salt but many together in community. Where two or more believers are gathered together, the Lord is in the midst. This salty community is a powerful force for hope and healing in a nation. Strengthens: Hikers use salt tablets for strength on a long journey. A salty Christian understands life is not a sprint but a marathon. He/she is strengthened in Christ all the way until the end. Melts slugs: Salt acts as a corrosive to slimy creatures. Sorry, we just had to put this in here because we needed an “S” word. But truly, salt melts dangerous things like ice on the road to protect cars from accidents during ice storms. Christian influence should corrode hazardous situations so people can live in safety. In the well-known Bible story of the destruction of Sodom and Gomorrah when the angel of God was leading Abraham’s nephew, Lot, out of the city, Lot’s wife looked back, signifying her desire to remain in a city given over to sexual perversion. Immediately she turned into a pillar of – you guessed it – salt. She was in her death what she should have been in her life. Today, it’s time for Christians to become a bit more salty! Image courtesy of tuelekza at freedigitalphotos.net.